Do you like Fresca? I do. Ok, perhaps I should go into a bit more detail. For those unaware, Fresca is made by Coca-Cola and is a citrus flavored beverage that favors grapefruit. I like Fresca, not as an all-the-time drink but every now and again I enjoy it. My enjoyment of Fresca directly correlates to how old I feel. “Wow, this is a refreshing, unique beverage…. Good God I feel like I’m 107”. I’m not sure why this occurs, but I associate the beverage with older people. 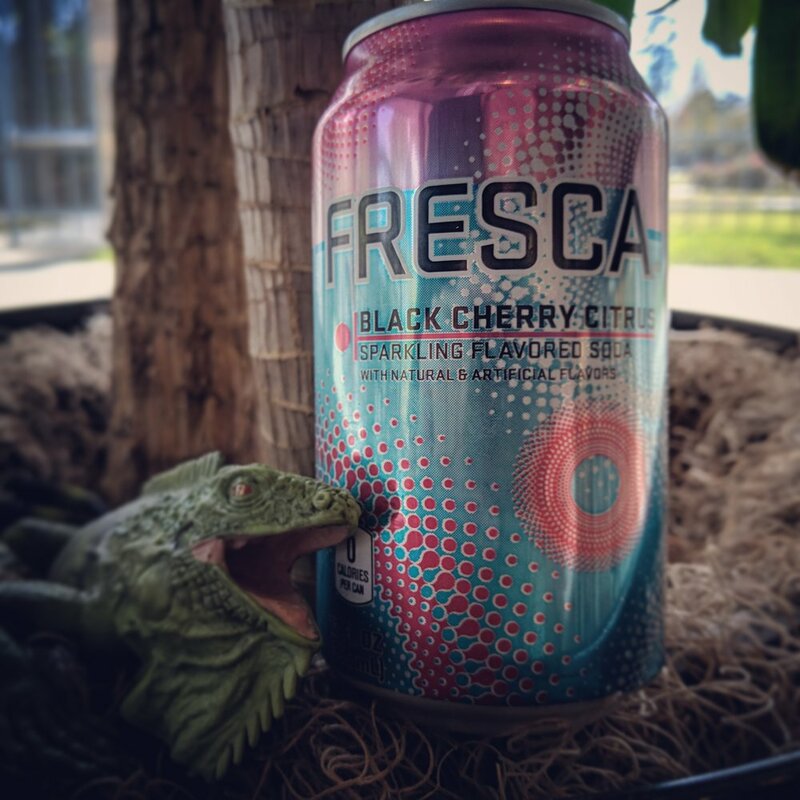 A citizen of the Carbo-Nation handed me a Fresca I’d never seen before, Fresca Black Cherry Citrus, and I knew I had to try it. What really colored me curious, was that I had no idea that other flavors of Fresca even existed until now. This was a fantastic revelation for a soda drinker like myself. Now all I have to do is consume it and tell you how it goes. Twist is also a bad "third wheel"
The scent that escapes after cracking open a cold can of Fresca Black Cherry Citrus is very citrus-centric. The black cherry isn’t apparent in the aroma aside from a sweet tickle each sniff seems to gather. My initial thought is that the black cherry taste will be fairly weak as to work better with the citrus base. Wow, that’s unusual in a good way. Immediately I find out how wrong I was assuming the cherry taste would be lessened. In fact that very cherry taste is what hit my mouth before anything else. After the cherry taste dissipates a bit a harsh mouthfeel reaches its hand in the ring and gets tagged to come in. Small, sharp, bubbles run over the back of my throat and remind me that Fresca is a citrus drink at heart. The two flavors work well together in this setting, they make for a good couple. Cherry is a sweet guy who does all he can to please. Citrus is a smart gal who likes to live on the edge a little bit, nothing too irresponsible though. They meet up in and hit it off like gangbusters. They’ve never met someone like the other before, it’s new and fun. They decide to go on a date that takes place inside a can of Fresca. I really love this place, Cherry. Do you? Do you really? I was hoping you’d say that. You worry too much, just enjoy life. You’re right, I… I… just get so nervous around you. At the same time though I’ve never felt safer. I get what you mean. It’s not everyday I run across someone like you, Cherry. HEY GUYS! DO YOU LIKE ME? HOW COME NO ONE IS TALKING TO ME? *Sigh* Aspertame, please be quiet. Cherry and I are trying to have a moment and you’re ruining it. Yes, if you could please just let us be for a bit. I really think we could create something great in this empty Fresca can. HEY GUYS! WHAT WOULD YOU RATHER HAPPEN…$3.50 WORTH OF COINS COMES OUT OF YOUR EAR EVERYDAY OOOOOOR YOU CAN EAT YOUR HANDS ONCE A DAY AND THEY’D GROW BACK? I wrote that scene instead of just saying the aftertaste is very “diet” and takes away some of the good will the cherry and citrus created at the beginning. It’s still a very good drink, but it could be great if it were absent of aspartame. All of that behind me, I was quite impressed with Fresca Black Cherry Citrus. I wasn’t expecting the cherry to be somewhat powerful and I certainly didn’t see the flavors working that well together. To go back to my previous statement, this makes me feel about 347 years old.